During this year Isabel will be honouring the 100th birth anniversary of two personlities who had a strong influence in her musical path : the composer Alberto Ginastera ( Isabel considers his Sonata op. 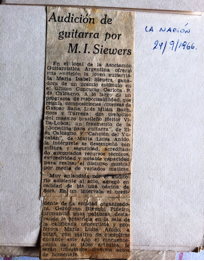 47 as one of the most inspiring pieces in the guitar repertoire and had the opportunity to do its first world recording ) and the guitarist and pedagogue Abel Carlevaro, whose wise advice she could already get during Carlevaro´s first summer course in Villa Gesell and during the lessons she took in Montevideo, through different periods, till short before Carlevaro´s death . By coincidence Isabel met both Carlevaro and Ginastera for the first time during the Camping Musical Villa Gesell in 1970. 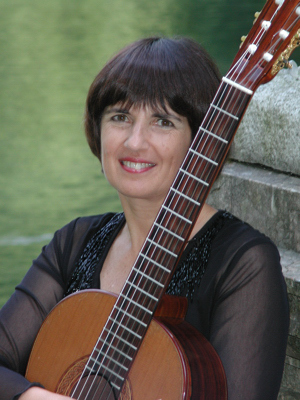 Isabel will play Carlevaro´s Concierto del Plata for guitar and Orchestra in the opening concert of the Orquesta Filarmónica de Mendoza concert Series in March and its reduced version for guitar and string quartet 8 called „ Quintet) at the Festival Santa María de los Buenos Aires in October. There are a number of videos of Isabel playing and teaching on the web. 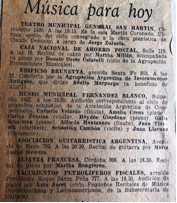 The Konex Awards were instituted in 1980 to be annually delivered so that the most distinguished Argentine personalities and institutions in every field important to the country's community be an example to our youth. 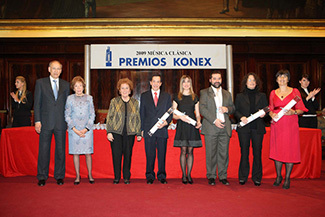 Every year the Konex Foundation offers those awards in different significant activities in the nation, in cycles that repeat themselves every ten years (Music: 1989-1999-2009). Initially and in the ten-year span from 1980 to 1989, such personalities received awards for their life-time accomplishments. As from 1990 to 1999 the accomplishments to receive awards represented the last ten years of activity. From the year 2000 through 2009 such cycle is repeated, and it will be repeated indefinitely. The Grand Jury selects the five personalities / institutions that show the most remarkable accomplishments in each of the chosen disciplines. The "Merit Diplomas" will be handed over in a ceremony at the Aula of the Faculty of Law of the University of Buenos Aires on September 9th. 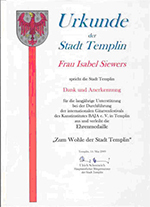 In May 2009 the Municipality of Templin, Germany, named Isabel Citizen of Honour as a symbol of gratitude for her long support to the cultural life of that city. Interview for "De Segovia a Yupanqui"
Abel Carlevaro´s "Quintet" with Clemens Gahl, David Arroyabe, Nicolás Pazur and Michael Tomasi. Round Table "María Luisa Anido"
Rotary Club Quito . Concert ,solo pieces and chamber music with the cellist Diego Carneiro and musicians of the Orchestra Amazonia. Chamber Music Concert with Iglerart Ensemble. Jury at the composition competition "Saarland Gitarrentage"
Pieces by Haydn, Giuliani, Ginastera. October 1st La Usina del Arte with Pablo Sangiordio and Adriana Caminoa ( violin), Adrian Felizia ( viola) and Gloria Pankaeva (cello). 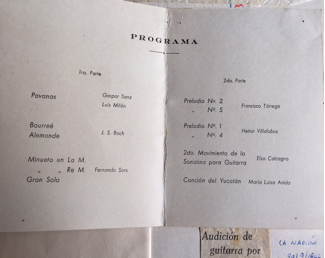 Solo pieces by Bach, Sor, Ginastera and Chamber Music including Paganini´s Terzetto for violin, cello and guitar and first performances in Argentina of Nikita Koshkin´s L´Istesso Tempo for cello and guitar and Abel Carlevaro´s "Quintet" for guitar and string quartet. Chamber Music Concert with Xenia Ganz ( mezzosprano), Amiram Ganz (violin) and Maxim Ganz (violoncelo) . Pieces by Giuliani, Paganini, Koshkin, Manuel de Falla and Ravel. Claude Bolling: Picnic Suite with Andrea Rainer (flute), Fausto Quintabá (piano), Albrecht Lippmann (doublebass) and Martin Köhler (percussion). Solo and chamber music pieces with María Isabel Siewers, Silvia Cambiasso (voice) Erica Pazur (narrator), Pablo Sangiorgio and Valeria Kaladjian (violin), Nicolás Pazur (viola) and Gustavo Diderle (violoncelo). All Saints Church Hall in Ponsonby at 6.00pm. 7 p.m. ( GMT 10 p.m.) Solo concert with global broadcast through internet. Carlos Guiastavino, his works for guitar. Música Viva solo and chamber music works.